Our Ancient Soils or strength elaborated in common. At some plots away from the Vintage Wines, our first vintages, Petite Chapelle and Clos Prieur, vie with their prestigious cousins in fineness and grace. These are the oldest soils of the domain. In 1877, slightly before the philloxera invasion, my great-great granfather decided to acquire a parcel of land near the Grande Chapelle, this area was then called Ergot or Petite Chapelle. By a strange irony of fate, the same year the French vines planted in the unbelievable density of 35 000 vines per hectare, underwent an attack of a small coleopterous insect which the winemakers called the ” writer ” or the ” scribbler “. The Ergot harvest was thus greatly reduced to six plots. But what a delicious wine ! Arthur, my great-grandfather aged ten years old, recalled this wine with much emotion. But,above all, he held in memory the pride with which his father sold this nectar in 1881 at the astronomical price of 480 francs a piece ! Some years later, in 1893 when some vines had already been replanted with American stocks, Louis bought his ” Clos Prieur ” near the Mazis. Was it this name with monastical evocations or rather its earth of light, stony, well-drained structure which made up my great-grandfather’s mind ? We can’t be sure but, whatever his decision, Louis was particularly well-inspired. 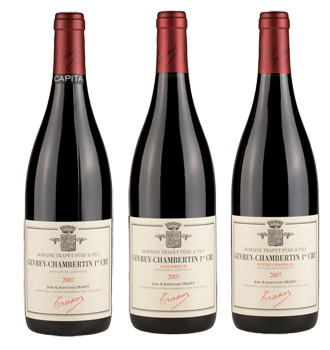 The same year, at the General Wine Exhibition, which preceeded the famous Hospices de Beaune Sales, the fruit of his first transplanted vines was given an ovation by his wine-making friends and amateurs from all over the Côte ! Today, our ancient soils of First Vintages, this Petite Chapelle and this Clos Prieur make us believe that mystically man possesses the soil he occupies. In fact, the soil possesses the man and this property, a strength elaborated in common, is reciprocal and inalienable !